SAN ANTONIO, TX -- Working across the aisle has become increasingly rare – especially in the deep red state of Texas. Perhaps even rarer is a 100 percent Latina owned political consulting firm. But in joining forces, two Lone Star Latinas are bucking convention. Former Democratic State Senator Leticia Van de Putte and former Republican Secretary of State Hope Andrade have founded Andrade-Van de Putte, a consulting firm that will help bridge the private sector with the public sector. Leticia Van de Putte, a pharmacist and small business owner, served in the Texas House of Representatives for over a decade before serving in the Senate for the past 15 years. Most recently she ran for Texas Lt. Governor. While she was not successful in this bid she gained national notoriety for the first bid of a Battleground Texas ticket. Together with Wendy Davis’ gubernatorial run, Van de Putte thrust women and Latinos into the political spotlight. Hope Andrade, sitting on the other side of the aisle from Van de Putte, served as Secretary of State under Governor Republican Rick Perry from 2008-12. She is one of the few Latinos/Latinas to hold a state level position in the history of Texas. And most recently Andrade served as a Texas Workforce Commissioner. Beyond her experience in state government Andrade is also a lifelong businesswoman who has worked in the healthcare sector among others. As she searches through a stack of bubble-wrapped frames in their new office space, Van de Putte explains that the bond to their family - especially their grandchildren - is what motivated the women to stay in San Antonio. 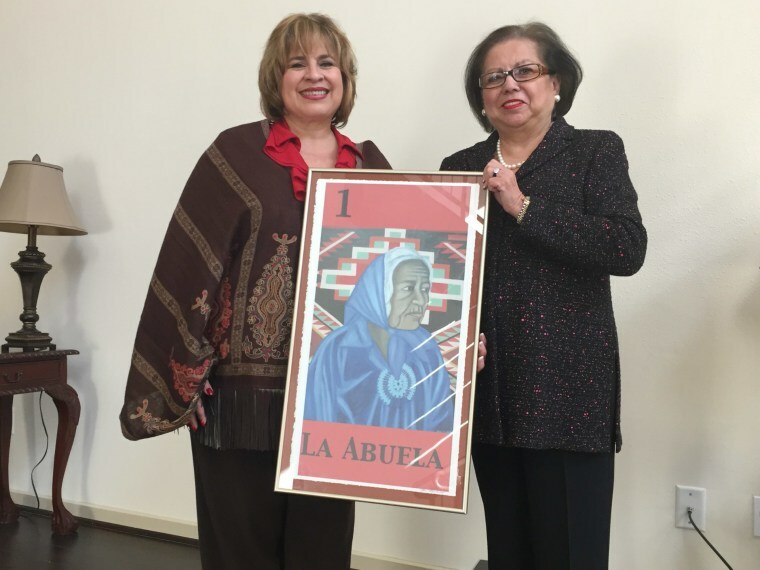 Van de Putte underscores her point by unwrapping and holding up a framed print of a kind but strong abuela. She points to this print as the simple justification of why her and Andrade decided to forgo D.C. or a partnership with a larger multi-national consulting group and instead set up their own shop. Nationally, the number of Latina owned political consulting firms can be counted on one hand. It is not an easy enterprise, but Andrade and Van de Putte note they have been fire-tested, and their ability to set up their own shop enables them to draw on their comparative advantages while staying true to their family priorities. Below is our edited and condensed conversation with Hope Andrade and Leticia Van de Putte where they discuss their new consulting venture and how they see the path forward for Latinas. Q: What is the scope and focus of Andrade-Van de Putte? HA: Getting people together to achieve a strategy or goal, bridging the gulf between the business community and government entities and even between different levels of government. Texas is a business-friendly state but still there is a need for government entities to understand how the “real world” works. LVP: Business needs to understand the diversity of cultures and practices within government. For example two government agencies—the Department of Transportation and the Department of Disabilities within Health and Human Services could not be more different. One is driven by engineers and numbers, the other by unique cases the social workers face. The key to navigating government is having knowledge of the culture and language of each of these entities and knowing how to translate that to the private industry. As a result of decades of experience in both worlds, this is something that we know how to do very well. Q: Why the decision to start your own business as opposed to joining a larger national or international firm? HA: Once an entrepreneur always an entrepreneur. As an entrepreneur you recognize opportunity where there is one - we saw it and we are banking on it. We are taking a risk. I’d make a terrible employee. The fact that we will start off small enables decisions to be taken quickly and I don’t need to deal with layers. In providing customized service for the client this set up is ideal. LVP: I have owned my own business. I was the toughest boss I ever had because everything reflects back to your family. I love the challenge. I take pride in forming this unique “first” partnership. I have a dear friend who said, "Ya era tiempo,” - it was about time. I love the opportunity and challenge of building something and I think that we can partner with other bigger firms, but this entity being ours is exciting and challenging. Q: Will you have a "Latina Advantage" in your new firm? In other words is there a unique vantage point that you bring? HA: The fact that we are Latinas adds to all of our professional experience of being business owners and former office holders – from two different parties. In addition to that as women and mothers we are about doing the right thing. Faith and family drive us. LVP: Private companies want to earn Latinos as customers. We have a trillion dollar buying power together with an intense brand loyalty. Add to that, 60 thousand Latinos are turning 18 every month. Q: What advice would you give to young Latinas interested in the political consulting or advocacy world? LVP: Latinas, sometimes we are so conflicted – so many obligations, pulled in so many directions. Trying to be so much to so many different people. This is not an easy business to get into or an easy business to be successful at. To want to go into this you have to have a good sense of who you are. Find a life work balance, find what grounds you and keeps you sane because if not you’re not of value to yourself or your organization. HA: Know your strengths. Know what you're good at. Know what makes you happy. Q: Regardless of your different political views how would you advise both parties and organizations to do more to get Latinos out voting and involved in 2016? HA: Empower us, don’t take care of us. The parties need to help Latino voters get educated on the candidates. At the same time Latinos need to spend time learning about each candidate and who’s right for our future and not letting partisanship influence that. LVP: Both parties need to go earn the votes not by what they say but by what they do. Also, they can’t make the mistake that it’s only about immigration. They need to understand the diversity of the Latino community and the importance of other issues such as education and the economy. Also, there is a huge disconnect. Latinos don’t think their voice will make a difference. Latinos do care but they feel disconnected. This is where parties need to figure out how to engage Latinos. Q: Will you allow men to join the firm? HA/LVP: Right now, no. Later, yes. This firm will outlive us and as we expand we want to attract young talent – both women and men. Victoria is a political scientist and commentator. She is a professor at the University of Texas. Victoria received her Ph.D. from Duke University and was named one of the top 12 scholars in the country by Diverse magazine. She previously served on the faculty of Northwestern University. Her research on political behavior has been widely published in scholarly journals and cited in the New York Times, Los Angeles Times, Chicago Tribune, Time, and POLITICO. Victoria lives in Austin with her husband Neftalí García and their children.